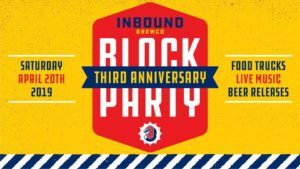 Celebrate Inbound BrewCo’s third anniversary on Saturday 4/20. We’re throwing a block party, complete with a dope lineup of local food trucks, live music, and craft beer. That’s right, we’re putting this sticky-icky IPA in cans, and you can be the first ones to drink its sweet nectar out of a 16oz pounder before it hits liquor stores.